An all-around ranch gelding, “Joker” has plenty of experience in all aspects of ranch duties. Countless calves drug to the fire and a lot of cattle doctored outside, extremely stout by the horn. Really nice to sort outside or in the gate. He has been used in ranch rodeos and his disposition would suit anyone. 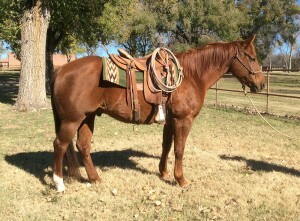 A really solid young gelding. AQHA Ranching Heritage eligible.